When someone my age decides that massacring co-workers is the logical next step in their life, I wonder at how drastically different their life must be from mine. Sayed Farook and Tashfeen Malik were married and had stable jobs. They left behind a 6 month old baby girl when they gunned down 14 people at a Christmas party. My wife and I are about to have a baby. What would have to happen in our lives to leave our brand new baby behind, destroying our family and 14 others? I really don’t want to know. The emotional turmoil that leads to murderous conclusions is not something I want to taste. Somewhere they lost hope for themselves, for society, but more importantly, they lost hope for their daughter. Or they placed their hope in an extremist idea that murder would create a better tomorrow. Either way Sayed and Tashfeen have greased their daughter’s grip on hope before she ever got to know who her parents were. Coming to terms with her parents’ actions won’t be easy. I hope she has a strong family and community around her as she grows up, one that is honest but gentle. Contrast Sayed and Tashfeen with Priscilla Chan and Mark Zuckerberg. 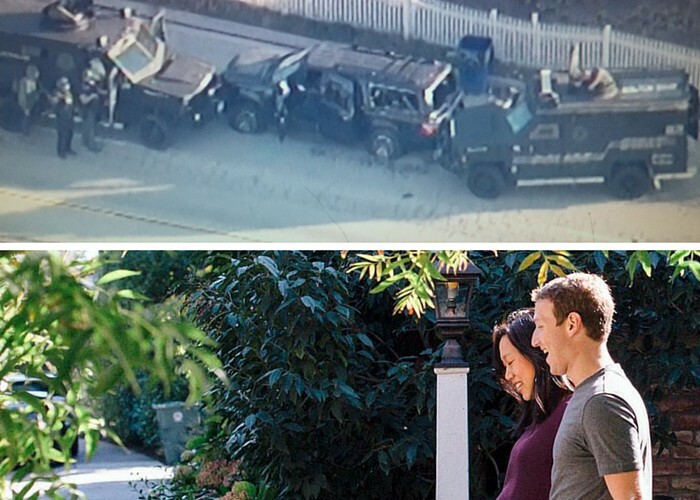 The day before shots rang out in San Bernardino, Priscilla and Mark announced that they are giving 99% of their Facebook shares to the Chan Zuckerberg Initiative, a corporation the couple started to invest in education and healthcare. Priscilla and Mark are acting on the inspiration that their daughter delivered. They want to mirror the hope she sparks in them. You can criticize their motives or the technical implementation of their “charity,” but it is still an action that is fixated on something bigger than themselves. Both couples have left a deep legacy for their daughters. We have to be careful about how we let either couple affect our own hope. To those who were directly affected by the San Bernardino shooting, you have a healing process to face. Hope will get you through it, but I don’t expect you to take my word for it. I hope there are professionals and family available to walk with you back to strength. The rest of us have the comfortable distance of digital devices to protect us from the immediate horror. We have an easy choice to make about how each couple will affect our lives. And the right answer would be to let them have very little, if any effect on our lives. Hope is an anchor. It is an idea that you hold close, anticipating that it will pull you to where you want to be. Charles R. Snyder talked about hope as a “dynamic cognitive motivational system.” What you think about feeds your hope. He said that you needed motivation (the will) and a workable strategy (a way) to keep hope alive. You have to see a way out and want to get out. When your thoughts have dug into possibilities, using failure as fuel for new approaches, hope will pull you through. Loosing hope (or even resisting hope) because of people leaves you stranded and way off course. Allowing Sayed and Tashfeen to damage your focus on a better tomorrow adds another casualty to their list of victims. The power of hope comes from the strength of what you’re anchored in. Hope that is in something bigger than humanity wins. There’s no safety being anchored in people. Celebrities and saints are subject to storms, just the same as you. Generosity is worth putting hope in — not generous acts (like donating 99% of your shares in Facebook), but the bigger reality that generosity can change the world. Mercy is worth putting hope in — not merciful acts, but the bigger reality that mercy triumphs where condemnation fails. Kindness is worth putting hope in — not kind acts, but the bigger reality that kindness will turn someone’s day around and even launch a friendship. Holding on to a better tomorrow motivates you to become part of what makes tomorrow better. When grief comes, grieve. But don’t let the source of grief damage your picture of a better tomorrow. That picture is going to help you heal and show your daughters and sons why hope is so powerful.